Over 6000 shoes have been found so far at the northern Roman outpost of Vindolanda. 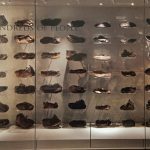 Analysis of these shoes shows that the people who lived there came from all over Europe and North Africa. The anonymous sender of the card points out that “A lot of people from a lot of places lived here”. Migration (the movement of people) is as old as humanity itself. Certainly people have moved into, out of, and all around the British Isles for millenia. Intriguing History gives more detail if you click here. Geography Cat’s human assistants visited Vindolanda a couple of years ago. It is a fascinating insight into the Roman occupation and into a working archeology dig, see the website for a wealth of information.